Dietrich Buxtehude was not only the greatest organ virtuoso of his time and a celebrated composer of both sacred and secular music; he was also a highly enterprising and innovative artist with a unique ability to form networks around himself. 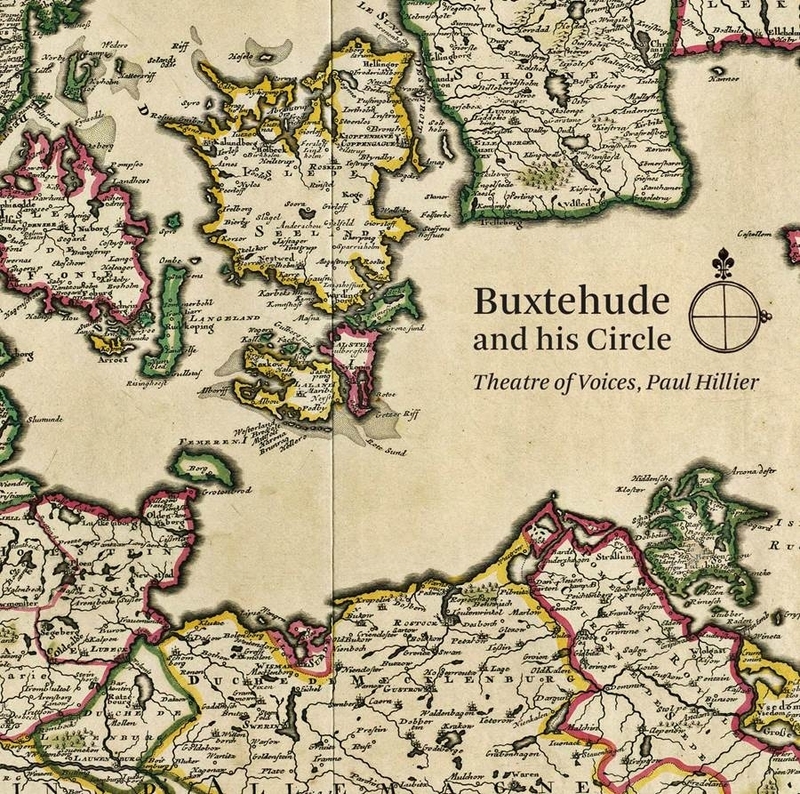 This CD, conceived by Theatre of Voices and Paul Hillier, gives a rare insight into the circle around Buxtehude – a musical circle of time, place, friendships, teacher-pupil relationships and even family ties; a network of excellent composers from northern German musician families, all of whom worked in or migrated to Scandinavia in the course of the 1600s. "Fremdrift og transparens karakteriserer disse fortolkninger, som atter engang vidner om ensemblets ambitionsniveau og begavede indsigt i netop denne del af musiklitteraturen." "En ny cd med Theatre of Voices og dirigent Paul Hillier giver en sjælden indsigt i kredsen omkring den store barokmester Dietrich Buxtehude. Cd'en er et vidnesbyrd om et stærkt musikalsk fællesskab i både tid og sted med venskaber, lærer-elev forhold og familiebånd; og med et netværk af fremragende nordtyske komponister." "Paul Hillier hat mit seinem formidablen Sängern und einem achtköpfigen Instrumentalensemble wieder einmal einen Hit gelandet." "As a CD it’s excellent, the music being calming and spiritual." Despite recordings, Buxtehude's cantatas are rarely heard. Rarer still are those composers with whom Buxtehude associated: Christian Geist, Nicolaus Bruhns, Franz Tunder and Kasper Förster, whose works for voices and instruments, together with Buxtehude's, are the subjects of this recording. And what marvels they are! A particular discovery for me is Bruhn's De profundis, but all the pieces demonstrate the highest level of craftmanship and are given excellent performances that capture the lively rhetorical spirit of the music admirably. This CD is highly recommended, especially to those fascinated by late 17th-century north German adn Danish music. ”Klanglich bietet die SACD (mit dem entsprechenden Wiedergabesystem) eine makellose Mischung und ein eindringliches Erlebnis. "This is a most enjoyable disc in which every single piece receives a fully convincing interpretation." "Interpretatorisch berührt nicht nur die Ernsthaftigkeit des Predigttons, sondern auch und vor allem die behutsame Versenkung in den Geist dieser Epoche"
"Interesting to hear how the highly diverse styles of the Buxtehude circle were cultivated and became the foundation for the music of the Bach and Händel generation." BEST ALBUMS OF 2016 "Die für Buxtehude und seinen Kreis charakteristische Mischung aus Strenge und Fantasie sowie aus Ausdrucksstärke und Innerlichkeit kommen auf dieser SACD optimal zur Geltung." BEST ALBUMS OF 2016 "Viel besser und feinsinniger kann man die Zeit vor Bach nicht ins rechte Licht rücken." Dixit Dominus Domino meo 5:49 9,60 kr. Jesu, meine Freude, BuxWV 60 11:27 12,80 kr. De profundis clamavi 11:55 12,80 kr. Dominus illuminatio mea 9:04 9,60 kr. Die mit Tränen säen 10:01 12,80 kr. Gott, hilf mir, BuxWV 34 15:44 16,00 kr. Confitebor tibi Domine 11:27 12,80 kr. When Buxtehude died in 1707 he had built up a reputation over many years as one of the most enterprising and innovative composers of his time. In his capacity as organist at the Church of St. Mary in Lübeck he had created spectacular oratorios, the so-called Abendmusiken, and was moreover generally known as the greatest organ virtuoso of his time. The very fact that J.S. Bach and G.F. Händel were both among his many visitors in Lübeck gives us an impression of how much of a pace-setting figure he was at the peak of his career. One strong characteristic of Buxtehude was his unique ability to form net-works around himself. Both in Elsinore and in Lübeck he quickly forged close contacts with the most influential burghers and merchants of the towns, who could help with contacts and funding for the realization of his ambitious projects. Buxte-hude had a wide-ranging network of colleagues, just as he himself had come from a large northern German and Scandinavian circle of composers and musicians. The idea behind this programme has been to provide insight into the circle around Buxtehude – a circle of time, place and personal relations; a network of composers from northern German musician families, all of whom worked in or migrated to Scandinavia in the course of the 1600s, and left their mark on the musical life of the Baltic region in cities like Danzig, Lübeck, Hamburg, Elsinore, Copenhagen, Gothenburg and Stockholm. At first glance it might seem that these composers had little to do with one another, partly because our knowledge of many of them is relatively limited. But on closer scrutiny a pattern of friendships, teacher-pupil relationships and even family memberships emerges: Diderich Buxtehude married Frans Tunder’s daughter; Nico-laus Bruhns’ father, Paul Bruhns, was a pupil of Franz Tunder; and his uncle Peter Bruhns was Buxtehude’s regular violinist for many years. Nicolaus Bruhns was a pupil of Buxtehude, and Buxtehude himself was a pupil of Kaspar Förster and of the organist Johann Lorentz, whose position Christian Geist took over in Copenhagen. This circle is one of the closest one can draw around Buxtehude, and it could also have included composers like Johann Theile, Johann Adam Reincken, Johann Lorentz, Gustav Düben, Christoph Bernhard and Matthias Weckmann. “The ninth day of May was Diderich Buxtehude’s last. More than anyone he was a skilled master of the art of music, and was with us for 38 years as Director of the organ in the Church of St. Mary ... He considered Denmark his native land, from which he was brought to our shores. He lived for some seventy years.” These are the words commemorating Buxtehude’s death in Nova literaria Maris Balthici et Septentrionis, July 1707 – a periodical for the Baltic region that appeared once a month in Lübeck and Hamburg. From this it is evident that Buxtehude was born in Denmark around seventy years earlier – that is, in 1637. The most likely town of origin seems to be Helsingborg in Scania, where Dide-rich’s father Hans Jensen Buxtehude is thought to have been an organist in the years in question. Hans Jensen Buxte-hude himself came from Oldesloe in German-speaking Holstein, while Buxtehude’s mother Helle Jespersdatter must be assumed to have been Danish. A letter from Hans Jensen Buxtehude to his son Diderich, the remains of which were found as late as the year 2000 in a rat’s nest in the canopy above the pulpit in the St. Olai Church in Elsinore, is written in Danish, and thus suggests that Danish was spoken in the home. In 1642 Hans Jensen Buxtehude took over the position as organist at the St. Olai Church in Elsinore and moved with his family over to the other side of the Sound between what is now Sweden and Denmark. Elsinore was at that time the collection place for the so-called Sound Dues, which exploited the narrow strait between Elsinore and Helsingborg to levy taxes on all shipping into and out of the Baltic Sea. This was a lucrative business for the Danish state, but a thorn in the side of the Swedish mon-archy, and indeed led in 1660, after many years of conflict and wars, to the ceding of Scania to Sweden by Denmark. Because of the levying of the Dues, Elsinore was at that time an important port with tracers from all over the Baltic region, with a market still dominated by the north German Hanseatic cities, including Lübeck as an important centre. In Elsinore Diderich Buxtehude grew up in a cosmopolitan cultural and trading environment with a strong German influence. Buxtehude’s schooling also had an inter--national ambience. He was educated at the ‘Latin school’ (i.e. grammar school) of the Church of St. Mary, which was the church for the German-speaking community in Elsinore – the same church where he was later to become the organist himself in 1660. Besides Bible studies and instruction in Latin and mathe-matics, he was also given a solid basic musical training in both monophonic and polyphonic song, while his organ playing and his great knowledge of the mechanics of the instrument must be supposed to have been passed on from father to son. We do not know much about Buxtehude’s youth, but undoubtedly some of his apprenticeship was spent in Copenhagen, just 40 km south of Elsinore. Two very different musicians who were both in Copenhagen in those years very probably had an influence on Buxtehude’s development: the organist at among other places the Nikolaj Church, Johann Lorentz the Younger (1610-1689), and the court Kapellmeister, Kaspar Förster the Younger (1616-1673). After spending some years in Copenhagen and enjoying an annual salary of 1000 Rigsdaler from the King, he lost the desire to be at the court for two reasons: first, because a French singer, Mademoiselle la Barre, arrived and on an equal footing with him was paid 1000 Rigsdaler; secondly because the war with Sweden was begun, and all other arts were reduced to a lower status. Thus the Kapellmeister took his leave in the year 1657, when he was 40 years old, and travelled back to Venice, stayed there for several years, and entered military service there for the Republic. This soon took him so far that he was elevated to the Knighthood of Saint Mark and became the captain of a com-pany. There he by no means set music aside, but won both great honour and promotion by it. Venice was then engaged in the Turkish War which was waged for 24 years, until 1669. The Danish War on the other hand lasted only three years. Although as early as 1658 a peace settlement was reached in Rotschild [Roskilde], it held for no more than a few months. However, as this situation little by little fell calm, the King recalled his Kapell-meister from Italy once more to direct the music that had been forgotten for some time. He took service all the more willingly as in the meantime Mademoiselle la Barre, whose humour was in no way attuned to the Danish way of life, had travelled back to her native country. The Chapel was then managed such that it achieved even greater fame than before. In that same year 1667 the director Kaspar Förster came to Hamburg and visited our Bernhard [singer and composer Christoph Bernhard (1628-1692); ed.]. They performed a Latin work by Förster for alto, tenor and bass. He had brought the alto, a castrato, with him from Copenhagen. The tenor part was sung by Bernhard, and the bass by Förster, who also played the basso continuo. The work described must have been a Latin sacred cantata in the style of the one presented in the present programme. Unfortunately, large parts of Förster’s pro-duction have been lost, including the opera Der lobwürdige Cadmus, which was performed in Copen-hagen with the French star soprano mentioned by Mattheson, Mademoiselle la Barre, in the cast. Förster’s music from the time in Copenhagen burned with Christiansborg Castle in 1794, and his music from Danzig was destroyed during World War II. Six trio sonatas, three oratorios and a whole 35 Latin cantatas fortunately survive, however, in the Düben Collection in Uppsala. These works probably come from the 1660s and were thus written or at least performed during his second stay in Copenhagen in the years 1661-1668. Like Elsinore, Helsingborg on the opposite side of the Sound was an important nodal point for travellers and merchants. It is not certain exactly when Buxtehude took over his father’s former post at the Church of St. Mary in Helsingborg, but he did so in the course of 1657 or 1658. The two or three years Buxtehude spent there were a tumultuous period in the history of Helsingborg and Scania. In the course of a few years the balance of power in the Baltic region had shifted radically with the conquests of the Swedish King Karl X Gustav in both Poland and northern Germany. In 1657 Denmark declared war on Sweden, with a disastrous coun-ter-attack as a result. Karl X Gustav, who stood with his army at Bremen in northern Germany, exploited the harsh winter to cross the frozen Great Belt and reach Zealand through Jutland and Funen with his troops. Denmark was on its knees, and Frederik III had no wish for a Battle of Copenhagen with the strong Swedish army, which now stood just 20 kilometres outside the city. On 26 February 1658 the Treaty of Roskilde (which Mattheson also mentions in Ehren-Pforte) was signed in Roskilde Cathedral, and in 1660 Trondhjem Province in Norway, as well as all the islands and regions east of Zealand, were definitively ceded; for the first time in history, Scania became Swedish. Whether the Swedish seizure of power was the reason why Buxtehude chose to go back to Elsinore is uncertain, but it is not unlikely. In the years after 1660 there was a systematic, sometimes violent cleansing of Danish language and culture from Scania. Whatever the case, the vacant and financially more attractive post of organist at the Church of St. Mary in Elsinore presented an obvious opportunity for Diderich Buxtehude to return to the town where his parents lived, and to the church in which he had sung as a boy. In October 1660 Buxtehude took up the post at the Church of St. Mary in Elsinore and moved into his childhood home with his parents in the organist’s apartments at St. Olai Church in St. Anna Gade. As the organist at the Church of St. Mary, Buxtehude, along with the cantor at the church, was responsible for the instru-mental and vocal music in the church, as well as the normal opening and closing organ pieces. Buxtehude quickly became a respected citizen of Elsinore and several times acted as godfather to the children of very prominent burghers of the town. As the organist at the Church of St. Mary in Lübeck, Buxtehude held the city’s most important and best paid organist post. It was his life’s third post at a Church of St. Mary, and the biggest and most prominent so far. In accordance with the general practice of the time in northern Germany this further involved marrying his pre-decessor’s daughter, Anna Margaretha Tunder, and the maintenance of Tunder’s widow Elisabeth for the next ten years. Anna Margaretha and Diderich had a total of seven daughters together, two of whom died in infancy. As was the case in Elsinore, it is evident from the baptismal certificates of the church that in Lübeck too Bux-te-hude quickly forged contacts with the leading figures of the city, for example the Rodde family, to whom we shall return later. He used these connections to initiate his ambitious plans for the church music. Although Franz Tunder (1614-1667) had already died when Buxtehude arrived in Lübeck, he was a strong presence in Buxtehude’s new life. Tunder was not only his predecessor in the organist post, he was also his father-in-law, and the previous occupant of the family’s house. We know very little about Franz Tunder’s youth and upbringing. He was born in Lübeck in 1614 and probably studied in Italy, and possibly in Copenhagen with Melchior Borchgrevinck, who from 1618 until his death in 1632 functioned as court Kapellmeister. From 1632 Tunder was court organist at Gottorp in the Duchy of Schleswig, until 1641 when he won the position as organist in the Church of St. Mary in Lübeck. Six years later Tunder also took over the responsibility as Werkmeister – an administrative post that came with Buxtehude’s position in the church. As both organist and admi-nis-trator Tunder purchased musical instruments and music, and thus created the basis for the well-established cantorate that Buxtehude took over after the death of Tunder. But Tunder did not only create the best conceivable framework; he also laid the foundations for the so-called Abendmusiken, which were to be the most impor-tant platform for Buxtehude’s musical expression. Abendmusiken were church concerts funded by the rich merchants of the city, with free admission for the public. Such privately funded church concerts were not unique to Lübeck. Buxtehude knew the practice from the organ soirées of Johann Lorentz the Younger at the Nikolaj Church in Copenhagen, and the great Sweelinck had been famed for such con-certs in the Oude Kerk in Amsterdam. In Lübeck Abendmusiken were held at the end and the beginning of the litur-gical year, that is the five weeks beginning with the last Sunday after Trinity, as well as the four Sundays in Advent. Although Abendmusiken were already an established event before Buxtehude arrived in Lübeck, with him they took on a new and unpre-ce-dentedly extensive form. Besides the cantorate of the Church of St. Mary Buxte-hude also involved Lübeck’s total of eleven official city musicians in his Abend-musiken, thus creating a large ensemble of the very highest standard. At the Abend-musik concerts Buxtehude exploited all his qualities as a composer and entrepreneur as well as his networks. It was Buxtehude himself who wrote the music, gathered and directed the musicians and singers, and personally laid out money on the expenses of the performances, for which he was later reimbursed by the prosperous merchants of the city. The actual works that made up Buxtehude’s Abendmusiken have unfortunately been lost, but programmes, text sheets and descriptions testify to large-scale semi-theatrical oratorios that extended over the five Sundays mentioned. In the cantata Gott, hilf mir (BuxWV 34), presented in this program, we get, however, a sense of Buxtehude’s unique gift for dramatizing a biblical text. Besides being an innovative dramatic genre in sacred music, Buxtehude’s Abend-musiken were also proof of his unique ability to mobilize the merchant class of Lübeck to donate large amounts of money year after year to public concerts. In return the donors received the librettos for the upcoming oratorios in advance and the best seats were reserved for them. At their peak the Abendmusiken were such an attraction that police had to be hired to maintain calm and order in the church, and they made him famous far beyond the city walls of Lübeck. In 1705 the 20-year-old J.S. Bach made his famous journey on foot from Arn-stadt to visit Buxtehude. Bach spent three months in Lübeck and was in the city during the year’s Abendmusik concerts, and presumably Bach took part in these con-certs as a musician. During his stay Bach copied several of Buxtehude’s organ works, and Buxtehude’s choral cantatas such as Jesu meine Freude (BuxWV 60) were undoubtedly a model for Bach’s early choral cantata Christ lag in Todes Bande (BWV 4) from 1707/08 and the later five-part motet Jesu meine Freude (BWV 227) from 1723. It also seems reasonable to suppose that in his Christmas Oratorio from 1734, which extends over six days in the Christmas period, Bach had Buxtehude’s Abendmusiken as a model. In clavier and composition he attempted especially to imitate the famous Dieterich Buxtehude, the organist of the Church of St. Mary in Lübeck. He brought this to such perfection that at his request he [Buxtehude] recommended him to Copen-hagen, where he spent several years and then became the appointed organist in the church in Husum. Today Bruhns is best known for his works for organ, which were greatly appreciated by Bach among others, but the half score of vocal works that have survived to the present are also all of the highest quality and show great compositional skill and a wealth of ideas. The bass cantata De profundis clamavi is an exquisite example of this, and a -magnum opus among the Stylus Phantasticus cantatas of the early North German -Baroque. It is possible that Buxtehude’s recommendation of him to Copenhagen was to his own mentor, the organist Johann Lorentz the Younger. Bruhns remained in Copen-hagen for three years before he returned to his home town of Husum in Schleswig, where he died, a mere 32 years old. We must therefore content ourselves with imagining how this huge talent might have developed if he had lived longer. Among the merchants in Lübeck who participated in the funding of the Abend-musiken was the alderman Matthäus Rodde (1598-1677). Rodde was a dynamic businessman who was involved in the burgeoning Atlantic trade, which involved everything from trading in Portuguese wine to Greenlandic whale blubber for use in lamp oil. In 1663 Rodde was an envoy to Stockholm and through him the earliest copies of Franz Tunder’s vocal music were copied for the Swedish court in Stock-holm by the court Kapellmeister Gustav Düben. In the years from 1664 until the 1680s Gustav Düben copied a large collection of the works of both Italian and German composers for the royal court chapel in Stockholm, including works by the composers represented on this release: Franz Tunder, Kaspar Förster, Christian Geist and not least Diderich Buxtehude. The Düben Collection represents 80% of Buxtehude’s known vocal music and a whole 95% of his instrumental chamber music, and is thus of crucial importance to the transmission of Buxtehude’s music to our own time. The collection of Buxtehude’s music was built up such that the original music was transported from Lübeck to Stockholm along with other merchant goods, after which it was copied and sent back to Lübeck. Christian Geist’s music is represented in the Düben Collection by a whole 60 vocal works. The careers of Christian Geist (1640-1711) and Diderich Buxtehude seem to have crossed paths without them ever meeting. They were born and died just a few years apart, and while Buxtehude grew up in Elsinore and lived most of his life in Lübeck, Christian Geist grew up in Güstrow in northern Germany a good 100 km from Lübeck, but worked and lived for most of his life in Scandinavia. Beyond this the two seem to have shared both stylistic features and a distinctly melancholy tone in their music. In 1669 Geist moved to Copenhagen, where he was engaged as a bass singer in the royal court chapel, but as early as June 1670 he resigned from his post to become part of the royal court chapel in Stockholm under the leadership of Gustav Düben. There he remained for the next nine years, until 1679, when he was appointed organist at the German church in Gothenburg. His Latin motets in the Düben Collection are thought to be from the years in Stockholm, while the German ones are from the years at the German church in Gothenburg. In 1684 he returned to Copenhagen and worked as an organist at several of the principal churches in the city. A document from 1684 shows that he served in both the Trinitatis Church and the Church of the Holy Ghost. In 1689 he took over the post of Buxtehude’s teacher Johann Lorentz at Holmens Church, and the -process came full circle. Pyramix DAW system with with DADAX24 Converter/Preamps and Tango Controller. Theatre of Voices thank the Church of Holmen for the use of their Klop choir organ on this recording. Also thanks to the staff of Garnisonskirken.